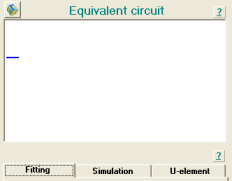 The equivalent circuit can be assembled in the equivalent circuit panel by mouse from two and more elements or imported from the Library of Models (a submenu of Model) . 1. Click a blue line in the Equivalent Circuit board. A pop-up menu will appear. 2. Choose an element from the pop-up menu. 3. To add more elements, click an element in the panel and choose the way of connecting the new element to the previous one (Series or Parallel). 4. Repeat step 3 until you add all the required elements to the circuit. With the addition of each element, the corresponding rows appear in the Constraints and Results table. Note: to maximize the Equivalent Circuit board right-click on the board and choose Maximize from the pop-up menu. To restore initial size of the board right- click and choose Minimize from the pop-up menu. 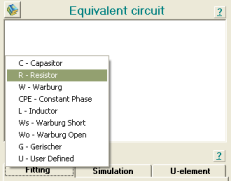 Use Clear Model in the pop-up menu to clear Equivalent Circuit board and the Constraints and Results table, use Edit Element - to replace the selected element by another element.